You know how I tend to have a million projects in progress at the same time. Especially now I have added embroidery to my list of obsessions, it is getting really dirty these days. That’s why I have decided to at least get this pile of projects a little less messy. 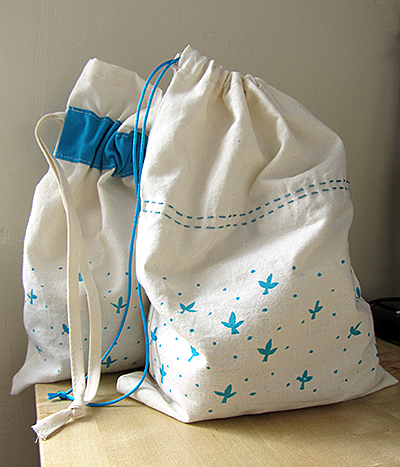 Some printed calico initially aimed to become kitchen towels have been recycled into project bags. I am not 100% happy with the design yet but I am delighted to have two more project bags. They are the ideal size to host medium projects like sock or lace shawl knitting, a couple of granny squares, etc. Now to move from my other obsession, that is blue, and I should have some new product up in my shop sooner or later. I really like the pattern you have put on these. I prefer the one without the wide blue stripe but that is only my preference. Thanks. I agree with you, I prefer the one at the front of the picture.